“The thief does not come except to steal, and to kill, and to destroy. I have come that they may have life, and that they may have it more abundantly. “I am the good shepherd. The good shepherd gives His life for the sheep”. (John 10:10‭-‬11). “Now there was a day when the sons of God came to present themselves before the Lord , and Satan also came among them. And the Lord said to Satan, “From where do you come?” So Satan answered the Lord and said, “From going to and fro on the earth, and from walking back and forth on it.” Then the Lord said to Satan, “Have you considered My servant Job, that there is none like him on the earth, a blameless and upright man, one who fears God and shuns evil?” So Satan answered the Lord and said, “Does Job fear God for nothing? Have You not made a hedge around him, around his household, and around all that he has on every side? You have blessed the work of his hands, and his possessions have increased in the land. But now, stretch out Your hand and touch all that he has, and he will surely curse You to Your face!” And the Lord said to Satan, “Behold, all that he has is in your power; only do not lay a hand on his person. ” So Satan went out from the presence of the Lord . Now there was a day when his sons and daughters were eating and drinking wine in their oldest brother’s house; and a messenger came to Job and said, “The oxen were plowing and the donkeys feeding beside them, when the Sabeans raided them and took them away—indeed they have killed the servants with the edge of the sword; and I alone have escaped to tell you!” While he was still speaking, another also came and said, “The fire of God fell from heaven and burned up the sheep and the servants, and consumed them; and I alone have escaped to tell you!” While he was still speaking, another also came and said, “The Chaldeans formed three bands, raided the camels and took them away, yes, and killed the servants with the edge of the sword; and I alone have escaped to tell you!” While he was still speaking, another also came and said, “Your sons and daughters were eating and drinking wine in their oldest brother’s house, and suddenly a great wind came from across the wilderness and struck the four corners of the house, and it fell on the young people, and they are dead; and I alone have escaped to tell you!” Then Job arose, tore his robe, and shaved his head; and he fell to the ground and worshiped. And he said: “Naked I came from my mother’s womb, And naked shall I return there. The Lord gave, and the Lord has taken away; Blessed be the name of the Lord .” In all this Job did not sin nor charge God with wrong”. (Job 1:6‭-‬22). “Be sober, be vigilant; because your adversary the devil walks about like a roaring lion, seeking whom he may devour. Resist him, steadfast in the faith, knowing that the same sufferings are experienced by your brotherhood in the world. But may the God of all grace, who called us to His eternal glory by Christ Jesus, after you have suffered a while, perfect, establish, strengthen, and settle you. To Him be the glory and the dominion forever and ever.” Amen. (1 Peter 5:8‭-‬11). “And the Lord said, “Simon, Simon! Indeed, Satan has asked for you, that he may sift you as wheat. But I have prayed for you, that your faith should not fail; and when you have returned to Me, strengthen your brethren.”(Luke 22:31‭-‬32). “I pray for them. I do not pray for the world but for those whom You have given Me, for they are Yours. And all Mine are Yours, and Yours are Mine, and I am glorified in them. Now I am no longer in the world, but these are in the world, and I come to You. Holy Father, keep through Your name those whom You have given Me, that they may be one as We are. While I was with them in the world, I kept them in Your name. Those whom You gave Me I have kept; and none of them is lost except the son of perdition, that the Scripture might be fulfilled. But now I come to You, and these things I speak in the world, that they may have My joy fulfilled in themselves. I have given them Your word; and the world has hated them because they are not of the world, just as I am not of the world. I do not pray that You should take them out of the world, but that You should keep them from the evil one. They are not of the world, just as I am not of the world. Sanctify them by Your truth. Your word is truth”. (John 17:9‭-‬17). 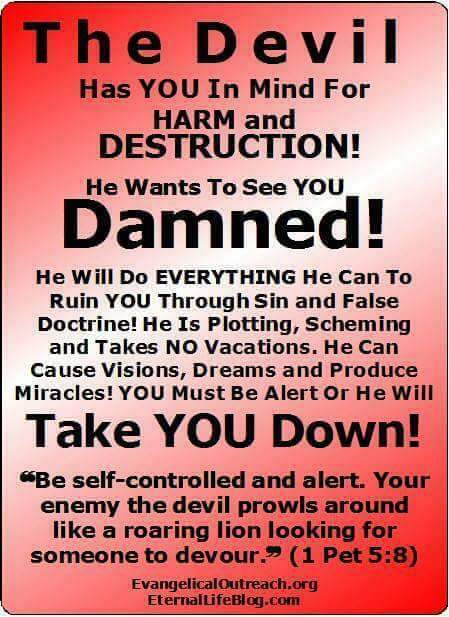 This entry was posted in Daily Message and tagged the devil is after you.